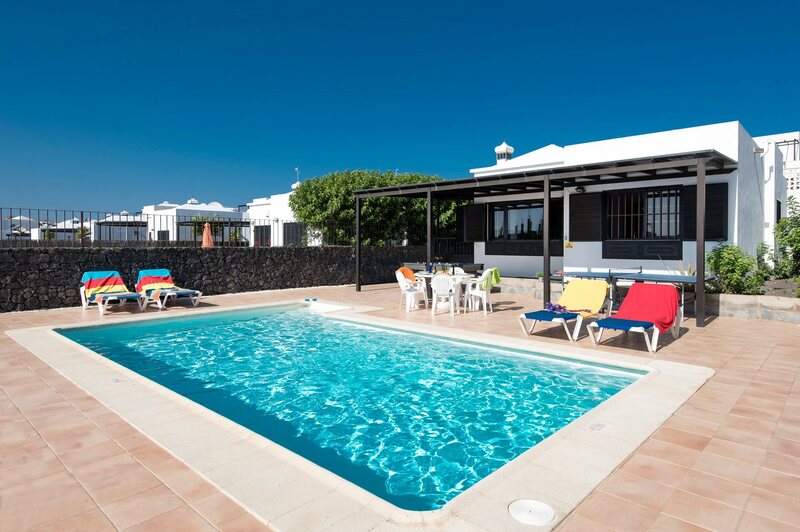 Villa Nazaret is a delightful 3 bedroom villa centrally located in Puerto del Carmen. You will be around 10 minutes' walk from the shops, bars and restaurants, plus the sandy beach of Playa Grande is 10 minutes further. The villa has a lovely outside area with plenty of space to soak up the Canarian sun and good quality interiors. What's not to love? Air conditioning/heating in the bedrooms and lounge, pool heating and WiFi are included. Villa Nazaret is all about the location. You'll be 10 minutes' walk from the shops, bars and restaurants. Perfect! Outside is a spacious terrace with ample room for sunbathing around the private swimming pool. There is a pergola which offers a shaded area for alfresco dining and the games tables. You can even see the sea between the houses! From the off road private parking area, steps lead you up to the pool terrace and front door. The living area is bright and consists of lounge, dining area and kitchen. There is comfortable seating, a flat screen TV, a table and chairs, plus the compact but well-equipped kitchen with a breakfast table and access to the utility room. There is a window overlooking the pool area. There are 3 bedrooms - a double with an en suite bathroom and 2 twins - in this single storey villa. All bedrooms are spacious and tastefully decorated. There is also a separate bathroom. This villa is a perfect choice if you prefer not to hire a car on your holiday. You're around 10 minutes' walk from a great choice of restaurants, bars and shops in lively Puerto del Carmen. The sandy beach of Playa Grande is 1 mile away. What's more the old town and harbour with many restaurants, some overlooking the sea, are 20 minutes away on foot. Our Villa Tahiche is next door. There are shops just a little over 700 yards from Villa Nazaret. If you are after some retail therapy, Puerto del Carmen is the place to be! Shops including designer clothes, shoes, sports, gifts, beauty salons and jewellery can be found here. There is a market in the harbour in the old town every Friday selling local goodies from in and around Lanzarote. There is a good number of places to eat and drink in Puerto del Carmen. The main Strip is ideal place to take a leisurely stroll taking in the beautiful sea views from one of the many cafe bars along the way. Food ranging from British, Indian, Chinese to typical tapas bars where you can sample the local dishes, cheeses and wines can be found here. Something for everyone! The sandy beach of Playa Grande stretches for several miles and is fringed with tropical palm trees. For sun-worshippers there are sunbeds and parasols for hire,and for the more energetic ones there are many sport activities to choose from! Rancho Texas Park provides entertainment for all ages. During the day there is an animal park with birds and animals from all over the world. At night it turns into a cowboy and Indian theme night with entertainment, BBQ, disco, line dancing and games. coastline and powder white sand beaches to be explored. There is an 18-hole golf course a 10 minute drive away, located just behind Puerto del Carmen. A more established course is also available in Costa Teguise on the East Coast. A great way to familiarise yourself with Puerto del Carmen is to hire a bike. This way you can make the most of the purpose-built cycle lanes that go along the coast and all the way into the capital of Lanzarote - Arrecife - passing rugged unspoilt beaches along the way. Villa Nazaret is not available to book for season as it is sold out. Take a look here at the Lanzarote villas that are currently on sale. Villa offered good value for money. Special mention to the always excellent and cheery cleaning maids. Good Villa Plus staff in resort. The villa was in a nice quiet part of Puerto del Carmen with a pleasant sea view over to Fuerteventura. It was nice and big, the air conditioning was excellent, furniture was comfy & clean, as was the whole villa and the maid service was excellent. The pool was superb and the pool table and table tennis were well used for lazy cooling down evenings. The whole Villa Plus experience was enjoyable and I shall recommend to friends and hopefully use again. We enjoyed ourselves and hope to do so again in the future. We would reccomend Villa Plus to anyone. Thanks again. Overall a lovely holiday. The villa was as advertised and in a great location. We would look at using Villa Plus again. Your staff were very helpful both prior to our departure and during our stay. Pool fence was much appreciated as we could all relax while the two year old played. Overall a very enjoyable holiday - thank you! Overall a well equipped, comfortable villa. The villa is in a good location, close walk to main strip but far enough away to get peace. Nice quiet street. Spacious inside and out, as a family of 2 adults with 2 children we had plenty of space. Good facilities in the villa.